The Top 5 Properties for Online Reputation in The 50 States and D.C. While the national average ORA™ score maintained status quo at 56, there was still some change across the states and District of Colubmia. Just 31 states scored at or above the national average, with Washington, D.C. ranking No. 1 with an average ORA™ score of 64. It has been the front-runner for the past two years. The credit for D.C.’s success goes to the property management firms operating in the capital. Out of the 421+ properties J Turner Research tracks for online reputation in D.C., WC Smith manages 74 properties—the most in the district. Its average ORA™ score of 67 is above the district’s average. Other companies who lead with the highest scores in D.C. include: Bernstein Management Corporation (78), Avalon Bay Communities, Inc. (77), Bozzuto, (75), Camden Property Trust (73), Gables Residential (72), and Kettler Management (67). Thirteen states have enhanced their ORA™ scores by two percent or more—Maine, North Dakota, Connecticut, Idaho, Kansas, Maryland, North Carolina, New Jersey, Nevada, Ohio, Oklahoma, Utah, and Wisconsin. Each of these states scored at or above the national average, with the exception of North Dakota, Nevada, Oklahoma, and Utah. In 10 states, all top five properties scored 90 or above. These include: California, Florida, Georgia, Massachusetts, Maryland, North Carolina, Ohio, Pennsylvania, Virginia, and Washington. Vermont had the lowest ranking property in the top five properties among all the states, with the property's ORA™ score at 41. Six states have dropped their scores by two percent or more since March 2016—Hawaii, Louisiana, Montana, Nebraska, South Dakota, and West Virginia. With -3%, Hawaii saw the most significant drop. More than 112 management companies are listed for the 255 properties included in this ranking of the top five properties in each state. Bozzuto (12), Greystar (10), and AvalonBay Communities, Inc. (9) manage the most top five properties across all states. Note: For the state average, all properties in the state were considered. For the property rankings, only the properties with a minimum of 20 reviews were considered. States with less than five properties or with higher averages than their top property’s scores are a result of an insufficient volume of property reviews. 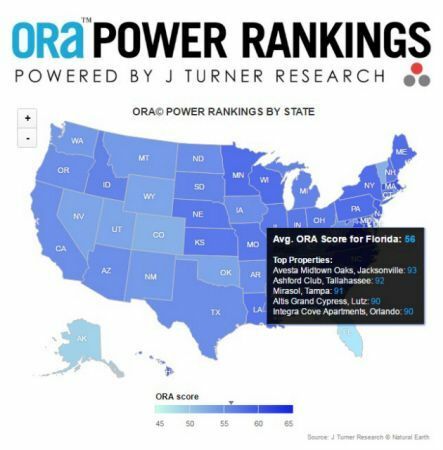 In an ongoing series of ORA™ Power Rankings, MFE periodically publishes a new ranking of apartment properties and management companies based on different parameters. The ORA™ Power Rankings is powered by J Turner Research. To arrive at the aggregated score, J Turner Research tracks and analyzes the online reputation of more than 59,000 apartment properties across all review websites on a monthly basis. To overcome the challenge of multiple ratings scales, the company has devised a statistical model to establish a single score for each property. This score, based on a 0 to 100 scale, serves as a benchmark to compare and contrast individual properties and portfolios nationally. Questions? Please contact the J Turner Research team at research@jturnerresearch.com.